I use MALWAREBYTES Firefox add-one version 1.0.30 as well! I am able to download any exe from the above page. strange, I can't reproduce this. it could be that your whitelist is corrupted, can you please re-install the browser extension and repeat the test? done ! but still the same block problem ! what else can I do ? To confirm that it's not just Gt-truth's machine, I can also see this download block. (Windows 10 1809, 17763.55 - Firefox 62.0.3 - MB extension 1.0.30). It can be 'ignored' and the installer file downloads OK. No sign of any problems with the downloaded file when scanned with MB3, Defender, or submitted to VT.
@Gt-truth can you confirm if all downloads are fine now? surfright was whitelisted. just I had to re-enable the firefox add-one and all surfright are still blocked ! what else should I do right now ? even this is a new version though but this isn’t fix this issue ? can you fix this ? That address is not blocked on my end, however I did try visiting the previous link https://files.surfright.nl/hitmanpro_x64.exe and it was blocked, however once I got through it leads to a 404 as that link is no longer valid so I guess it's irrelevant now if it's blocked. @exile360 I do not think they’ve made any changes . however , refer to my #6 post of this topic ! and just a heads-up : there are no any 404 error message of any downloads link! I just check that after I saw your reply ! both link above are working OK! but the first one which is on my #1 reply is still blocked . 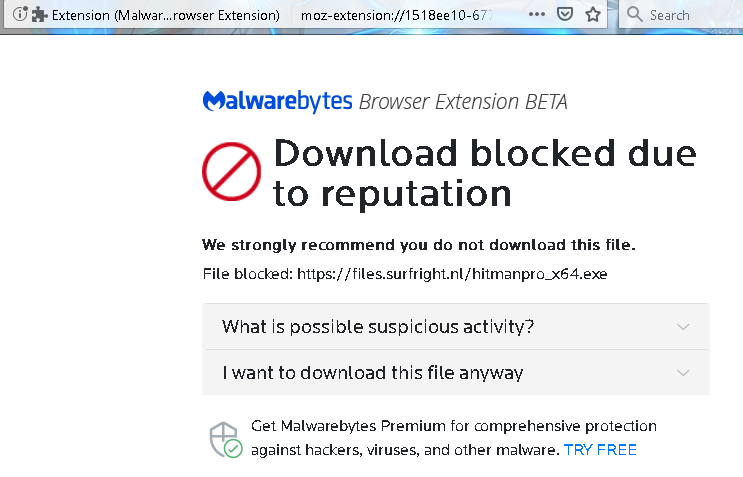 however , the second link is not blocked by which by MALWAREBYTES for Firefox. My bad, I got the two programs mixed up (HitmanPro.Alert and HitmanPro). Still, no blocks here for either; I just downloaded from the one on the main HMP page you linked to in your first post (via the 30-day trial download button/link at the top of that page, which leads to the URL you reported for the download) and it downloaded just fine. This must be some kind of intermittent issue like those we've seen in the past with other FPs and database sync issues. I strongly suspect it is related to the caching features in the two browsers (both FX and Chromium are known to cache many connections/pages etc. ; a fact I've verified many times when comparing their functions to those of other browsers like IE11). I just tried it in both Iron (Chromium browser with the MB plugin installed) as well as IE11 (no plugin, obviously; just MB3's Web Protection and my other defenses, none of which ever show a page like this) and it gives me that exact 404 page in both. edit: Never mind on the 404 error; apparently there's something odd about the formatting of the URL you posted in the code box; I checked it in notepad and the .exe portion at the end shows as a smaller font meaning it isn't the same type of text which would explain the 404 since it technically doesn't mean the same thing as what the URL actually is. I tested in IE and the download works, and did the same in Chrome and it was indeed blocked by the plugin. Apologies for the confusion, I guess that Cyrillic or whatever it is at the end of the URL in your post had me screwed up (if you're trying to render it unclickable, you may do so via italics; just make any one or two of the characters within the URL italicized as I did above where it is in bold, or select the entire string and press Alt+Right-click and select Remove link in the editor to remove the active linking in the final post). @exile360 thanks for update !